← Which way, Ivory Coast? Liberia is not a poor country. It has abundant natural resources: gold, diamonds, iron ore, oil and timber. Its agricultural potential notably includes rubber and palm oil. In the 20th century this small West African country, the size of Ohio, had the world’s largest rubber plantation, was Africa’s largest producer of iron ore, and had the world’s largest mercantile fleet. A bloody coup d’état in 1980 changed this situation. Master-Sergeant Doe assassinated the Americo-Liberian president William R. Tolbert Jr., a Baptist pastor, and became the first indigenous president of Africa’s first and oldest republic. However, from a thin, soft-spoken ‘liberator’, Samuel Doe turned into a greedy, corpulent dictator, who rigged elections, violated human rights and imprisoned political opponents - among them, Ellen Johnson Sirleaf. Prince Johnson, one of the warlords in Liberia’s civil war, brutally tortured Doe to death in 1990. 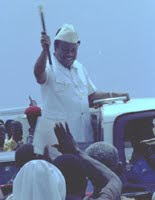 Another warlord, Charles Taylor, was elected in 1997, after the first civil war (1989-1996). Soon followed the second war (1997-2003). The 14 years of civil conflict killed an estimated 250,000 people, mutilated many more, and traumatized even more. When the civil war was over, the country had to start from scratch, foreign investors had left, the modern economy was ruined. Liberia was back to the situation in 1822, the year the first black colonists and people of mixed race arrived from overseas, the U.S.A., and imposed their rule on the indigenous population. Liberia started the 21st century with an elected president, former warlord Charles Taylor, who was forced to resign in 2003, subsequently went into exile, but was later handed over to the Sierra Leone War Crimes Tribunal in The Hague, in the Netherlands, where he was charged with eleven criminal charges related to his alleged involvement in Sierra Leone’s civil war (1991-2002). The verdict is due this year. Liberia’s hope now is Ellen Johnson Sirleaf, a former international banker and international civil servant, and already for decades one of Liberia’s most prominent citizens. She performed important functions in Liberia: in the late 1970s she was Minister of Finance serving in the Tolbert Administration. She became president of Liberia in 2006 following multi-party elections, defeating internationally acclaimed football star George Weah, and thus became Africa’s first democratically elected female president. Ellen Johnson Sirleaf’s skills, experience and international connections have resulted in an impressive number of important achievements, in particular the cancellation of the country’s staggering US$ 4 billion dollar debt and the signing of concession agreements with foreign investors. Liberians themselves do not have the capital needed to invest in major, large-scale productive activities in the country, exploiting the country’s economic potential. This is an old story that has haunted the country’s past and played an important role in its internal politics. It even was a major cause of the country’s first coup d’état, in 1871. But let’s return to 2011. Liberia’s three million people are among the poorest of the planet. 85% of the people live on less than US$ 1 a day. I will not quote more statistics – most statistics are ‘guesstimates’. However, unemployment in the modern economy is sky-high, salaries for paid jobs extremely low, and people in the subsistence economy survive at an extremely low level. Hence, any investor – foreign or domestic – is expected to provide relief, opportunities and hope. Since the start of her Administration, President Ellen Johnson Sirleaf has managed to convince a growing number of foreign investors to come and invest in Liberia. Like in the ‘good old days’, the late 1950s end early 1960s, when Liberia had double digit growth figures and ranked among the fastest growing economies of the world. Among the foreign investors in the country’s rubber sector are the nowadays Japanese owners of the former US rubber giant Firestone. She has atracted important foreign investors in the gold and mining sector too, but may be her biggest success was the multi-billion dollar deal with steel giant Mittal to exploit the rich Yekepa iron ore deposits and rehabilitate the former LAMCO mine, in the north of the country, bordering Guinea. This week it was announced that a US$ 3.1 billion investment in the palm oil sector was agreed, with a Malaysian investor. This raises total foreign investments in the palm oil sector to over US$ 5 billion! The investments will be spread over the coming years and Liberia may thus become one of the world’s major producer of palm oil and related products. Foreign investors need political and macroeconomic stability and sound macroeconomic policies that are conducive to economic growth, and they do not want to deal with predatory, corrupt politicians, civil servants or other people. However, Liberia was declared the world’s most corrupt country in 201o by Transparency International and the 2010 Human Rights report of the U.S. State Department also was not very flattering for the country, accusing the Liberian judicial system of corruption. 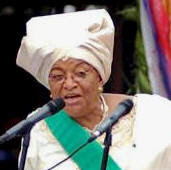 President Ellen Johnson Sirleaf had proven her important stabilizing role in the present political and economic environment. Her engagement in fighting corruption is equally important. She is convinced that Liberia has to recover, the country has to be reconstructed after the devastating years of the recent past. In October of this year presidential elecions will be held. Among the main candidates are the imcumbent president, the 72-year old Ellen Johnson Sirleaf; Winston Tubman, nephew of Liberia’s longest serving President William Tubman of Americo-Liberian descent – who ruled the country for 27 years; Prince Johnson, nowadays Senator in the Liberian Legislature, and who tortured President Doe to death; and Charles Brumskine, once a Taylor ally, now an independent candidate. This entry was posted in Charles Taylor, Ellen Johnson Sirleaf, Liberia, Liberian Economy, Liberian History, Samuel Kanyon Doe, William R. Tolbert Jr., William V.S. Tubman. Bookmark the permalink.